When Shinzo Abe became the Prime Minister of Japan in December 2012, he was regarded with the kind of reverence that politicians dream about. He was featured in a hit pop song ("Abeno Mix"), hailed as a "samurai warrior," and featured on the May 2013 The Economist cover as none other than Superman. 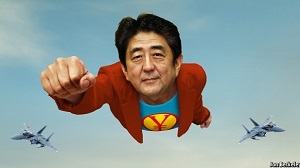 But in the two short years since, Abe as Superman has been struck down by the superpower-zapping force of economic kryptonite. On November 17, government reports confirmed that Japan's brief respite from a 20-year long entrenched deflation was over as the nation's 2nd & 3rd quarter GDP shrank 7.2% and 1.6% respectively.